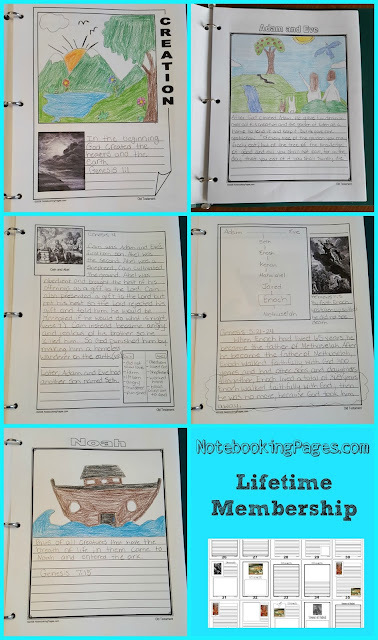 To aid in our summer studies of focusing on God's Word, we have been taking advantage of the Lifetime Membership from NotebookingPages.com. If you are unfamiliar with what notebooking actually is, think scrapbooking for school subjects. It's a fun way for students to make subjects come to life. Students journal and draw about what they have learned and every page shows each student's own unique personality. There is no right or wrong way to notebook which is the beauty of this system. 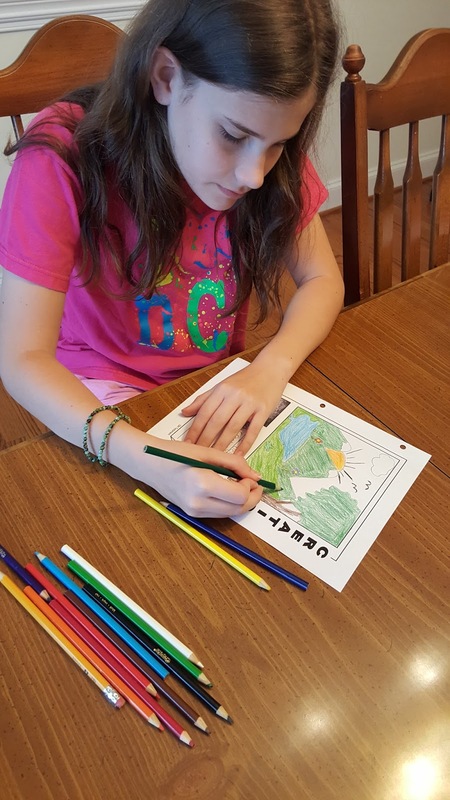 They offer pages that cater to students who may prefer to draw and students who prefer to write. There are also options available for a mix of the two. 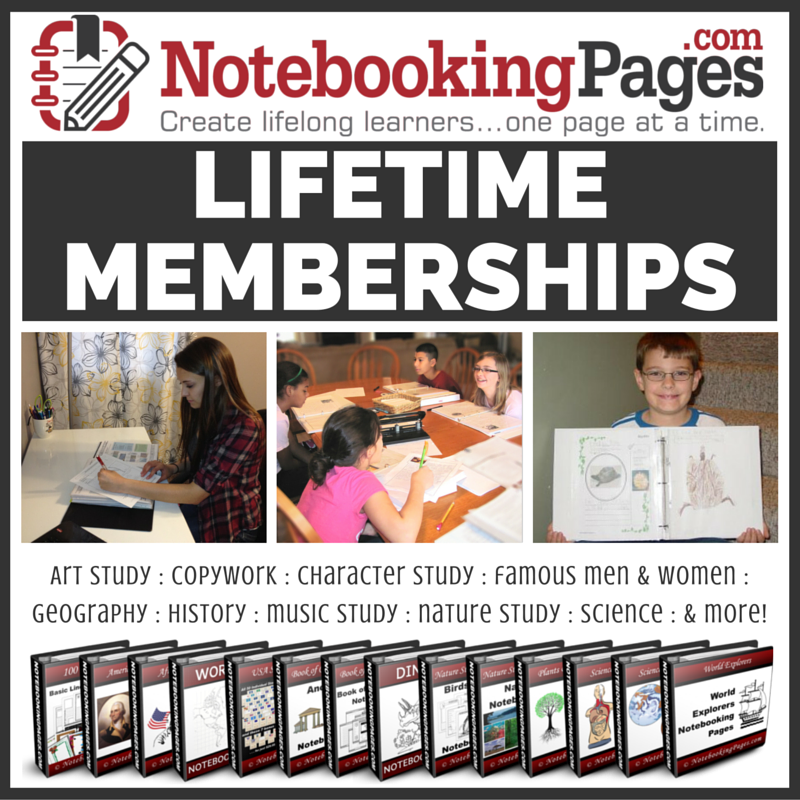 NotebookingPages.com offers 1000's of pages to download and print in Bible/Character, Alphabet, Famous People, Fine Arts, Geography, History, Holidays, Language Arts, and Science/Nature. They also offer basic lined notebooking pages that can be used with any subject. So far we have have just touched the surface on the pages available with this membership. The most fantastic part is your membership never expires so you can take all the time you need to complete your projects! You also gain free access to any future updates that may occur with your lifetime membership. 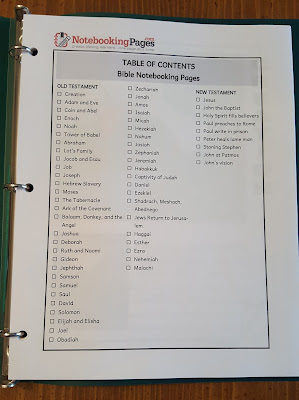 For our homeschool, we focused on the Bible notebooking pages. This set takes you through the Old Testament and New Testament from Creation to John's Vision on the island of Patmos. It comes in a zip file and once unzipped it contains 54 files of PDF printables. This set alone has over 500 different pages to choose from! I used this set with my daughter, Sarah, who is 12. 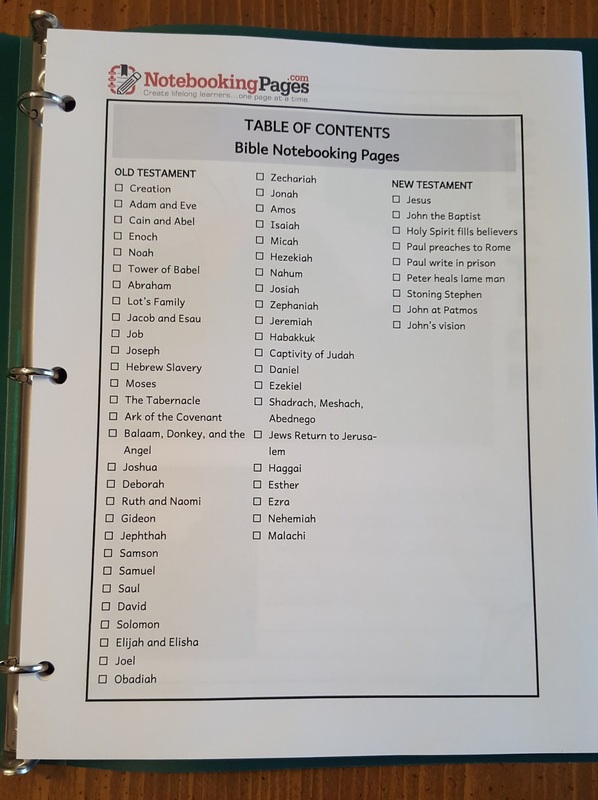 We used the Bible notebooking categories as our devotion point each day. We began by researching the Bible verse or verses then added our own drawings or timeline and journaling information. 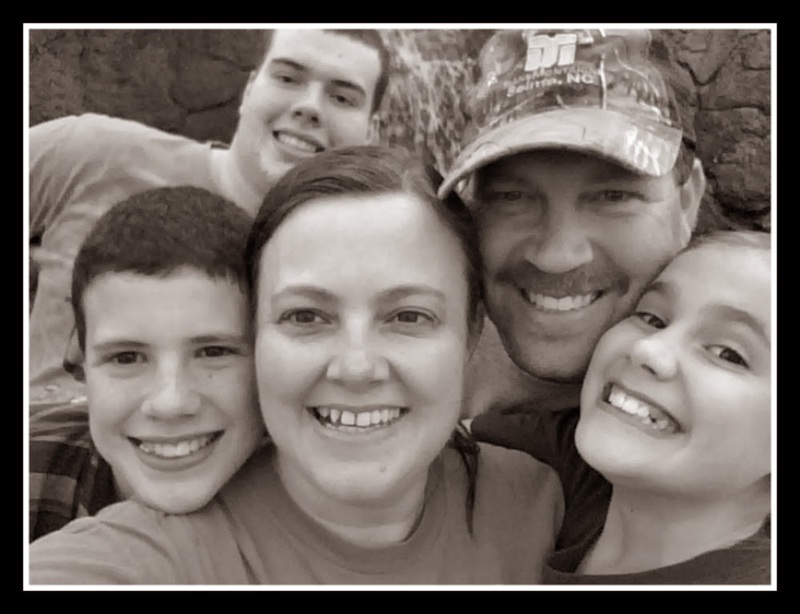 Some days, we added a paraphrase with our thoughts and some days we simple copied the verse from the Bible but it has been a great time to spend with each other and growing in God's Word. 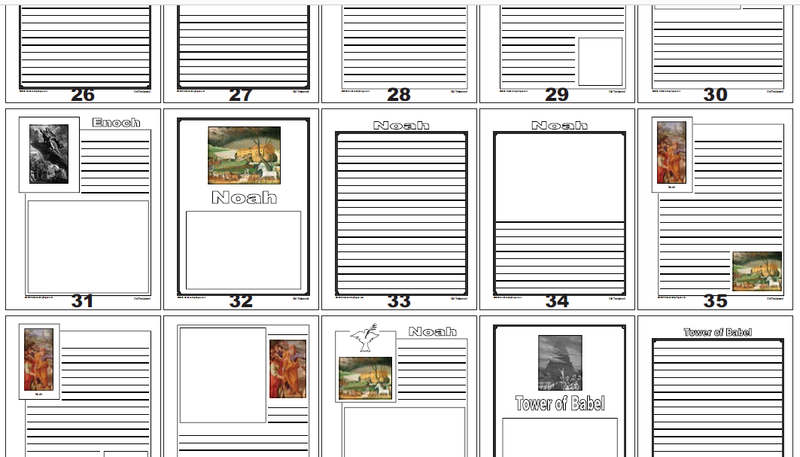 One of the files included an overview of every page in the set which made it so much simpler to pick and choose which pages we wanted to work with. Below is just a small sample of what is available. 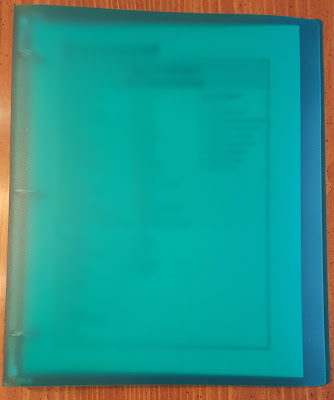 We hole punched the pages and inserted them inside this small 3 ring flexible binder. 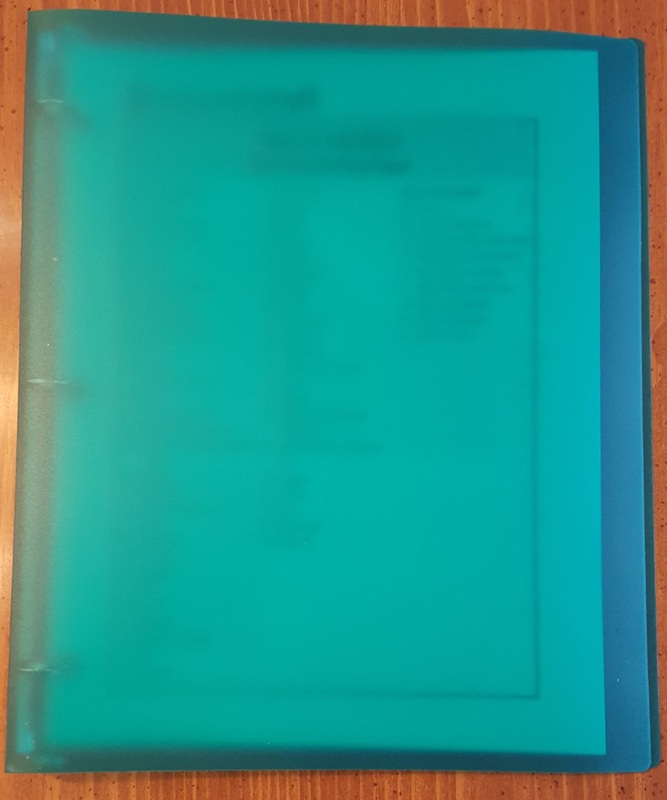 You could also add them to the binder with a clear front and decorate with your own binder cover. The Table of Contents page included was great to keep us on track. 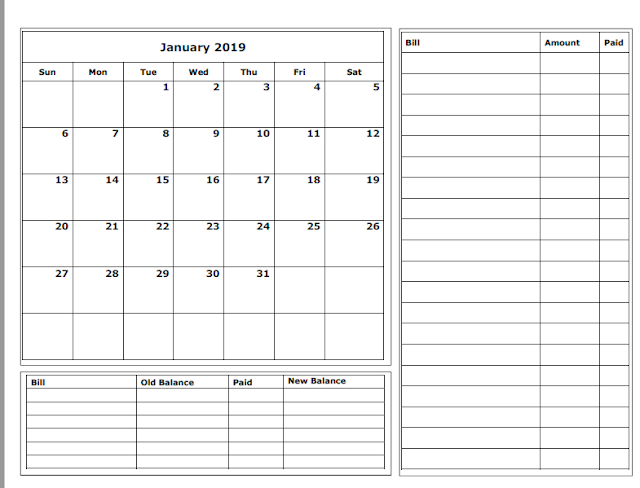 You could also number your pages to correspond with the Table of Contents if you wish to make pages easier to look back on. 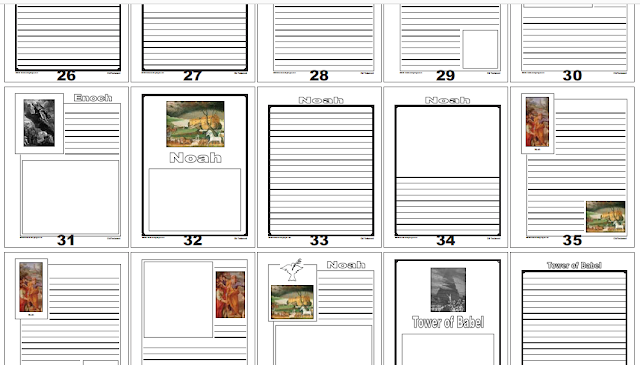 Here are just a few of the Bible notebooking pages that we completed. Sarah enjoyed this way of working through the Bible. She is very creative and loves to draw so this was a perfect fit for her. There are also pages available with illustrations for those who would rather just narrate what they have learned as well as a combination of both. I love to do special activities on holidays so I know the holiday section will come in handy for us too. There are pages for most of the traditional holidays. 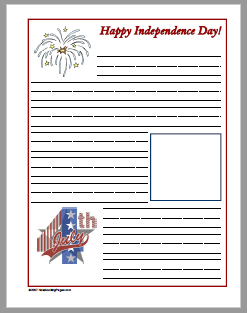 Here is a sample of just one of the pages offered for the fourth of July. Next school year, we will be focusing a lot of other countries and geography so I have already begun to explore and print some of the pages in that section for next year too. The geography notebooking pages include maps, country pages, and more. NotebookingPages.com offers lots of free pages too. You can sign up for a free sampler to see if this unique system will work for your family. I love that there are so many options in so many subjects so I don't have to take the time to search the internet for each individual page. When you are finished with your pages, you will have a real treasure on your hands written and designed by your student. Find out more about NotebookingPages.com on Facebook and Twitter. Some notebook words are really going into such a way that it will help you to get your mind think about those words so many of times. http://www.nephrologyfellowship.com/ you'll be find some helpful information about the academic writing service. Some note book reviews are really great that some of their words will talk about you ,your life, your society and so on. look here will give you some amazing idea and very effective for the papers writing.